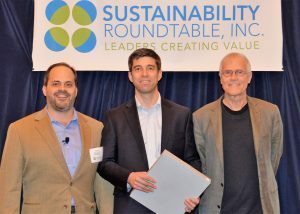 Submitted by: Sustainability Roundtable, Inc.
Hakon Mattson (center), pictured with Jim Boyle (left) and Paul Hawken (right). CAMBRIDGE, Mass., Jan. 11 /CSRwire/ - Sustainability Roundtable, Inc. (SR Inc), the leader in Sustainability Program Assistance, announced that at Intuit’s global headquarters in Mountain View California in December, SR Inc recognized Anthem as the Sustainable Business & Enterprise Roundtable's (SBER) 2018 Outstanding Corporate Leader and Matthew Mayerhofer, TripAdvisor’s Global Design, Operations, Maintenance & Sustainability Lead as the SBER’s 2018 Outstanding Corporate Executive. Anthem joins former SBER Outstanding Corporate Leader of the Year firms such as Bloomberg, Cisco, Salesforce and SAP due to Anthem’s industry leading best practices in driving greater environmental sustainability throughout Anthem’s national operating portfolio in 23 states, which supports more than 58,000 associates. Significantly, Anthem is the first health care organization recognized by SR Inc as an Outstanding Corporate Leader of the Year. In 2018, Anthem was named to the Dow Jones Sustainability Index (DJSI) as a leader among Health Care Providers & Services companies. The decision to include Anthem on the DJSI was based on a broad analysis of Anthem’s practices across economic, social and environmental issues. Despite limited resources and no dedicated internal staff for sustainability, Matt Mayerhofer has led his team in developing and implementing an effective and expanding sustainability strategy across TripAdvisor’s global operations. The strategy includes ambitious goals such as eliminating disposable products, reducing bottled drinks, reducing total energy consumption, reducing trash, and increasing reporting to investor relations. The program’s vision to “Travel Widely, Tread Lightly” aligns with the company’s enterprise-wide mission and has already enabled impressive wins on energy and waste reduction efforts in the less than two years the program has been in place. Anthem is working to transform health care with trusted and caring solutions. Anthem’s health plan companies deliver quality products and services that give their members access to the care they need. With over 73 million people served by its affiliated companies, including nearly 40 million within its family of health plans, Anthem is one of the nation’s leading health benefits companies. One in eight Americans receives coverage for their medical care through Anthem's affiliated plans. At Anthem, corporate responsibility defines them as an organization and is best demonstrated by their ability to make a positive difference in the health and well-being of their consumers, employees and the communities they serve. To learn more about Anthem’s corporate sustainability program, please visit www.anthemcorporateresponsibility.com. TripAdvisor, the world's largest travel site, enables travelers to unleash the full potential of every trip. With 702 million reviews and opinions covering the world's largest selection of travel listings worldwide – covering 8 million accommodations, airlines, experiences, and restaurants – TripAdvisor provides travelers with the wisdom of the crowds to help them decide where to stay, how to fly, what to do and where to eat. TripAdvisor also compares prices from more than 200 hotel booking sites so travelers can find the lowest price on the hotel that's right for them. Along with advancing their sustainable operations, TripAdvisor’s GreenLeaders Program showcases a variety of eco-friendly hotels and B&Bs, from budget to luxury – and they’re all committed to green practices like recycling, local and organic food, and electric car charging stations. To learn more about TripAdvisor, please visit tripadvisor.mediaroom.com/us-about-us. Sustainability Roundtable, Inc. (SR Inc) is the leader in Sustainability Program Assistance. SR Inc provides confidential, membership-based, Strategic Advisory & Support Services to help management teams set goals, drive progress & report results internally and externally as they lead their organizations to greater sustainability. Customer, talent, investor and regulator interest in more sustainable and healthy real estate and corporate operations increases every year. To help enterprises meet the expectations of these important stakeholders, SR Inc helps enterprises with industry specific Sustainability Programs across all areas of corporate operations with a special focus on solution assessments, Sustainably Healthy Workplaces, as well as the procurement of on-site and off-site renewable energy and advanced energy systems. For information regarding Membership in SR Inc’s Sustainable Business & Enterprise Roundtable service, please visit our website at www.sustainround.com or call us at 617-682-3630.